Key Findings: 10 PTF-supported projects in Argentina were recently reviewed confirming that small, short, one-off projects can make a difference even if they are barely a drop in the bucket of fighting corruption. Political will, stakeholder collaboration, and continuity of effort were key determinants of success in the short and longer terms. Effective matching of project scope and grantee capabilities also helped. To the limited extent tried, attempts to change private sector behavior were less successful than improving the public sector. 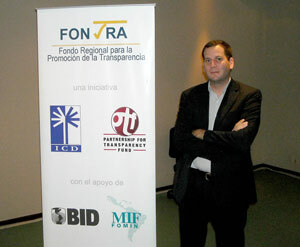 PTF reviewed in 2012 the impact of 10 projects on transparency and access to information supported in Argentina between 2004 and 2011. Seven projects were supported by grants from Fondo Regional para la Promoción de la Transparencia (FONTRA) and three directly by PTF for a total of USD 0.2 million. This review assessed the impact of these projects beyond specific activities and results obtained during project execution. Final project reports by the grantees and independent evaluations of the projects supported by FONTRA indicated that most of the projects by and large carried out the activities and obtained the specific results expected at the onset. But they said less or nothing about whether this mattered in the longer run and from the broader viewpoint of improving governance, increasing civil society participation, and reducing opportunity for corruption. The review sought to narrow that gap and also draw some lessons that may be applicable to future PTF work in this area and in Argentina. The impact assessment was based on examining all documents on the 10 projects available in PTF and FONTRA online files, limited search of some grantee web sites, and discussion with officials of the grantee organizations and others. Based on the file and web site reviews, a one-page brief on each project was prepared, which summarized the project’s objectives, activities, results, impact, and overall assessment. The project briefs were sent to the respective grantees, who were invited to discuss and mark up the brief, provide additional information, and suggest external contacts familiar with the project. Four of the six grantee organizations, accounting for eight of the ten projects and 84 percent of the total grant amount, responded favorably and led to substantial discussions by telephone and Skype, additional documentation, and marked-up project briefs. The final versions of the 10 project briefs are in PTF files, as is additional material sent by grantees. Rough notes on each discussion are in the reviewer’s files. The main conclusion of the review was that most projects had a positive impact beyond their narrow definition and short duration, including projects that did not fully meet their immediate targets. This experience confirmed that small, short, one-off projects can make a difference even if they are barely a drop in the bucket of fighting corruption. Political will, stakeholder collaboration, and continuity of effort were key determinants of success in the short and longer terms. Effective matching of project scope and grantee capabilities also helped. To the limited extent tried, attempts to change private sector behavior were less successful than improving the public sector. Like project costs, it was not always possible to separate the impact of projects supported by PTF and FONTRA grants from the impact of related projects or broader programs. For example, two projects funded by FONTRA simultaneously in the province of Santa Fe claimed, quite plausibly, to have contributed to the same benefits. A project on electoral campaign financing at the national level was an integral part of a CIPPEC program aimed at determining the extent to which the objectives of the electoral reform of 2009 were achieved regarding transparency, fair competition, and respect for political rights. This is a common problem in project analysis, but it does not impede identifying which projects had an impact even if their share of the aggregate impact cannot be determined. Assessing impact beyond the projects’ narrow confines and short durations was limited by the paucity of relevant information. Grantee reports that place more emphasis on critical analysis and self evaluation rather than on descriptive detail, and PTF routine follow-up review some time (say, two years) after project completion, would have helped, and could be considered in the design of future PTF projects. The seven projects financed by FONTRA had been independently evaluated after submitting final reports. This evaluation, however, like the final reports submitted by the grantees, focused on the extent to which the projects carried out the activities they had planned, obtained the results they sought, and spent the grant as promised, as well as describing problems along the way and how these were overcome. The independent evaluations confirmed that overall this was achieved. But the question of whether the projects mattered in the wider context of the quest for good governance and civil society participation, was not addressed. The projects financed directly by PTF included some comments on impact and broader lessons. Discussions with the grantees in the course of this review proved to be a valuable source of additional insight. PTF helped strengthen small grantees in the provinces, and these were responsible for some of the projects with the greatest impact. Longer-term PTF support of successful small NGOs would enhance project and PTF impact. PTF could also play an important role facilitating NGO networking.